Home > latest news > news > Greek players letter to Prime Minister: "Instead of bonus, build a new stadium"
Greek players letter to Prime Minister: "Instead of bonus, build a new stadium"
African players need to learn one or two lessons from this, yeah we all know they play for the money but we all know most of these players earn more in their respective clubs. They could do without all the media drama and killing team spirit, Ghana for example could have made it to the knockout stages easily but they let the love of money get to them. Winning the World Cup or making history will bring money that they could think of. 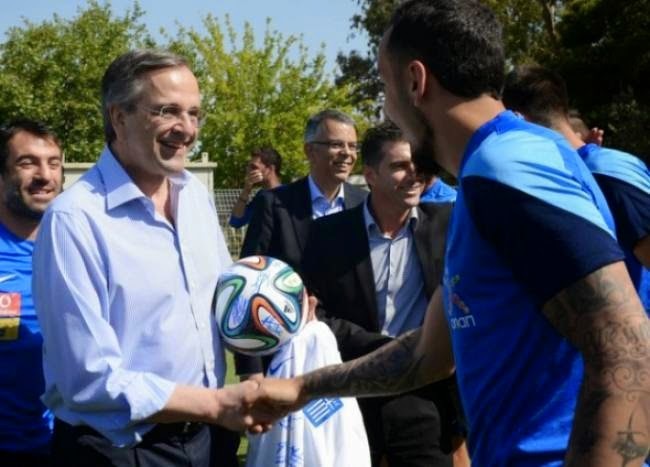 A report have broken out of Greece saying he Greece team have written to their prime minister Antonis Samaras and told him they are not interested in their World Cup bonus but simply want the money to be put towards a sports centre for the national team. This letter was written on Sunday June 29, 2014 and signed by all 23 squad members, it came as a result of Greece reaching the second round of the World Cup for the first time in their history. Presumably, the Greek squad realise they are all well-paid individuals and are concerned for the future of Greece in international football.